Spurred on by the great success with Evie la Luve's Mimi Bikini I was eager to try the newly released Summer Bikini. Having seen so many lovely designs by Shopcabin in Spoonflower sports lycra I thought perfect time to test. I wanted a bright print but not too much white that might discolour. 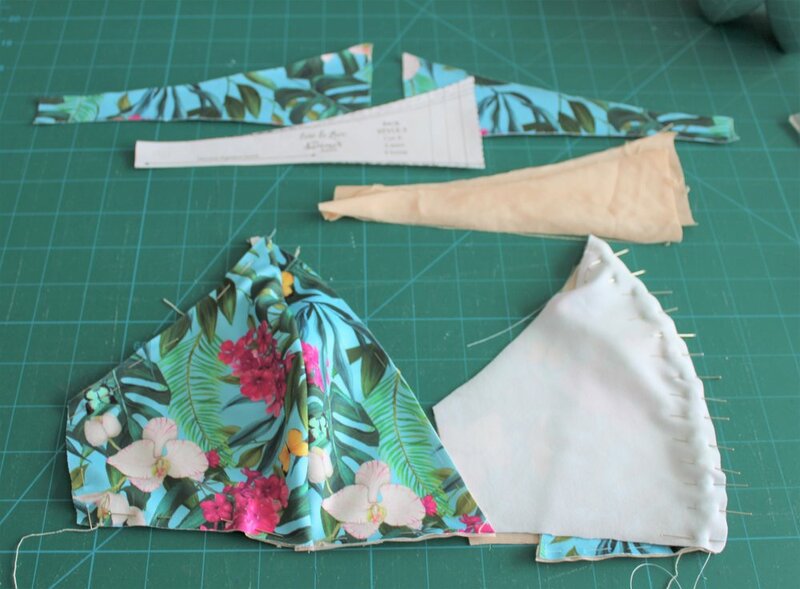 How perfect is this Love Summer Florals & Tropical Leaves in Aqua. I had bought enough fabric for both but with time running out I went with style 2 for the top and style 3 for the bottoms. I had also stocked up on the elastic when I bought the pattern as this is the only website I could find all three widths needed. The quality of the elastic makes all the difference. I started with the bottoms. 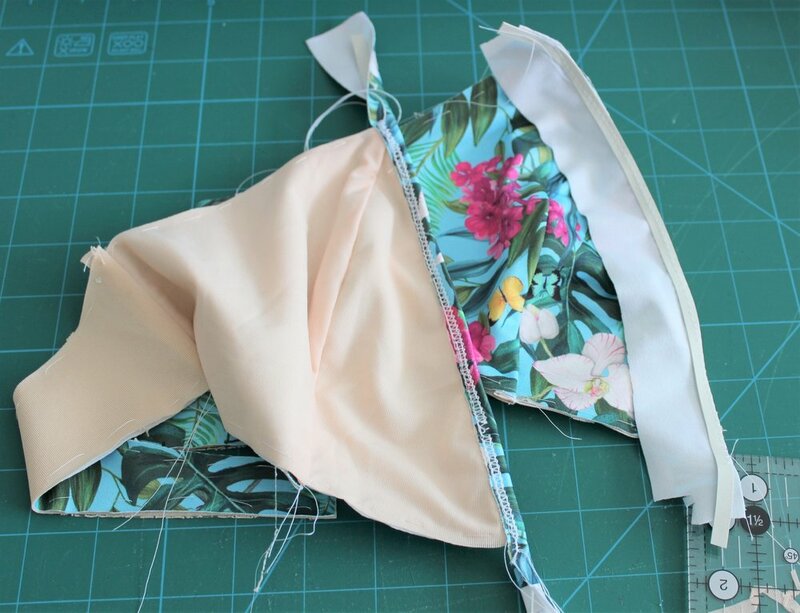 I cut out the pattern in my regular size and compared to a good fitting RTW pair of a similar shape that are sadly no longer wearable because of the inadequate elastic. I didn't follow all the instructions but instead made up the fabric and lining separately so there would be no seams. Then I basted together using a ball point needle and silk thread. Due to the construction method I now had to attach the elastic in the round for both legs and waist. Whilst I do this quite a lot using a zigzag stitch I hadn't done this whilst attaching elastic with an overlocker! I do like the coverage the overlocker gives to the inside edge so thought I would give it a go. There is no elastic guide for the legs you just apply with a small amount of tension. I've got a feeling for this now. Starting at the side seam (as this would be covered by the bow) , the trick was to stop close to where I had started and cut the elastic just so it butts against the other end and overlock over the joint. I was very impressed with my first attempt - where the red arrow is pointing. The elastic is then just folded over and I used a zigzag to hold in place. I do have a coverstitch machine but thought was a bit much for the bottoms. The little ties were a bit more problematic due to the fabric. You stitch around leaving a gap to turn and then stitch the opening shut. The fabric didn't like this so after the first I slipped stitched the second in place. The fabric didn't press well. However still looked fine. 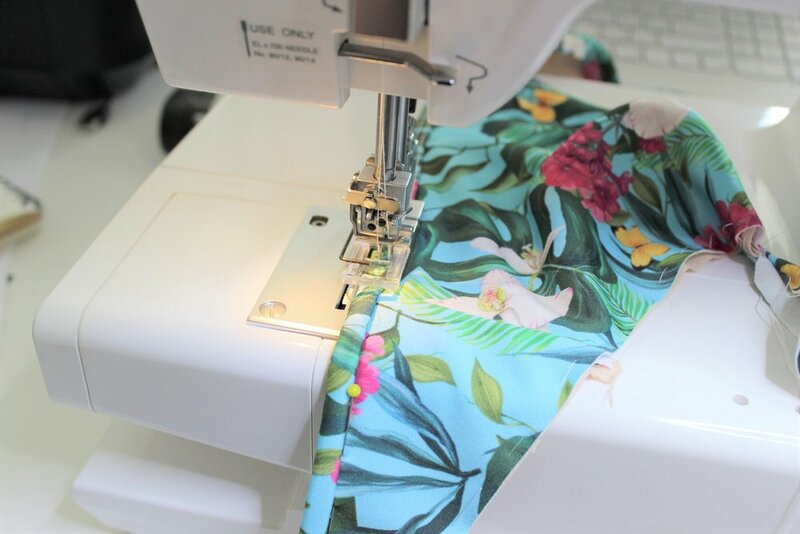 You have the option to stitch in place over the side seam but l left loose. Although when taking the picture they did move around so I may eventually fix in place. Moving on to the top. 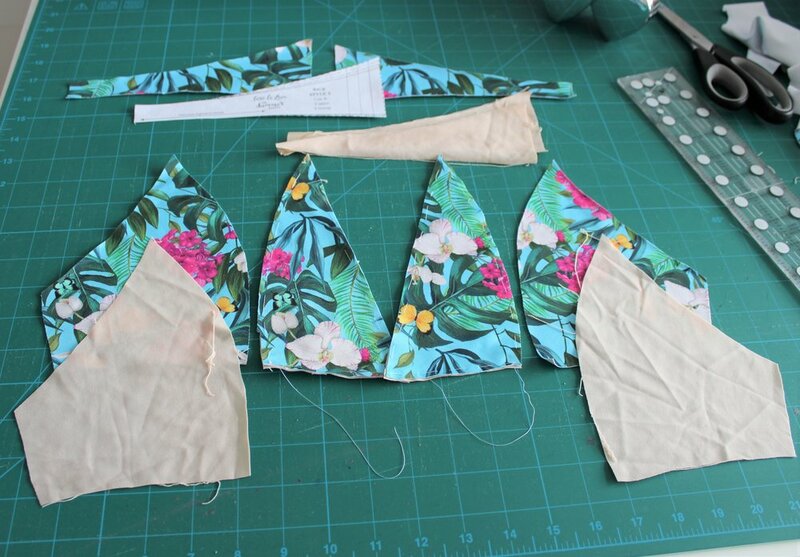 I cut the pattern pieces in my regular size and taking off the seam allowance I made a paper cup just to check the coverage. No problem with that. I went with the instructions on this except I didn't press the curved seam other than a little steam over the tailors ham. With the seams all enclosed the front edge elastic is applied using a technique I hadn't used before except for straps. You sew a fabric strip to the centre front edge of the fabric. You then apply elastic to the edge within the seam allowance and then wrap the strip over the front and sew along the band you have created. Then you trim the fabric back to your stitching. As this is a band I thought the coverstitch would look better than a zigzag. Although it was hard to trim the fabric neatly close enough to the stitching even with my small applique scissors. The next step is to overlap the centre fronts. The pattern advised to try on at this point and adjust the overlap if necessary. So I pinned on the fastener and it looked fine. I also got to test out the various fastener colours. I had ordered two of all the colours of the fabric from Sewing Chest but thought the pink worked best. You do the same for the bottom edge. I thought this might be a little bulky at the centre but it went through fine. The straps are made by the fabric strips extending past the top edge and there are cutting guides for this. I pinned the strips in place along the ditch as the fabric was a bit slippy going through the coverstitch. I then tried on again to check the turn back for the fastener. A little loose so I took in a further 1/2" each side. The bow detail just finishes the set off perfectly. Verdict - another great make. Getting quite good at this sewing lark. The patterns does say advanced and probably not for someone who has not used stretch fabrics or elastic before but the instructions and photos are so clear. I have had some very expensive RTW brands that looked so pretty but I just couldn't swim in them. It's all about the elastic and and the fact you have made them to fit. As with all Evie la Luve's patterns they fit like they look in the illustrations. This doesn't have as much coverage as the Mimi but different looks for different days and maybe at the start of the holiday if you eat as much as I do. Swimwear and lingerie sorted just a few Ogden Camis to make over the weekend!